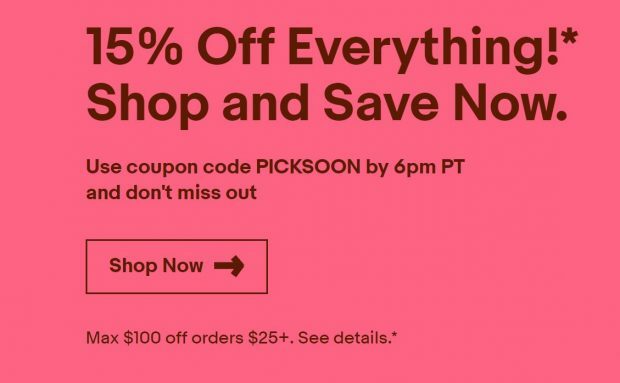 This Coupon is a 15% discount off a minimum purchase of $25 valid from 8:00 AM PT on September 27, 2018 until 6:00 PM PT on September 27, 2018. The Coupon discount is capped at a maximum value of $100. Discount applies to the purchase price (excluding shipping, handling, and taxes) of eligible items on eBay.​com, cafr.ebay.​ca and ebay.​ca. *Eligible items exclude warranties and protection plans, as well as items from the Coins & Paper Money, Gift Cards & Coupons, and Real Estate categories. Coupon must be used within a single transaction (and can include multiple eligible items), while supplies last. Max one redemption per user. Previous Previous post: Tokina FiRIN 100mm f/2.8 FE AF Macro Lens at Photokina 2018 ! Next Next post: Zeiss Full Frame Mirrorless Camera Leaked Online !